A day after it hit the store shelves, the iPad mini 2 unsurprisingly paid a visit to the folks at iFixit. As expected, Apple’s slate got a proper teardown to go with the traditional iFixit repairability score. The first thing to grab the attention under the hood of the second generation iPad mini is a beefy 24.3Whr battery. The latter is a massive upgrade over the 16.3Whr unit of the first generation – hardly a surprise as it has a lot more pixels to light up than the previous model. The larger battery of the new iPad mini allows Apple to quote the same battery life as that of the first generation. Impressively, its size hasn’t affected the waistline of the slate – it has only grown by .3mm. Going forward, the teardown reveals an LG-made display, Toshiba flash memory, as well as silicon from the likes of Texas Instruments, Broadcom, Fairchild, and USI. The second generation iPad mini got the lowly repairability score of 2 by iFixit. The reason for it was the huge amount of adhesive found inside the tablet. It holds all major components inside the tablet, thus making repairs difficult. 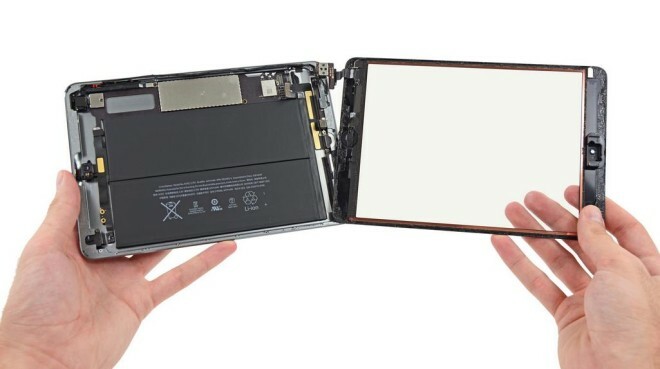 You can see the iPad mini 2 teardown walkthrough video from iFixit below.